We love Vampirina and when we heard there were new toys out, we definitely wanted to review them. You can see our previous Vampirina toy reviews here! 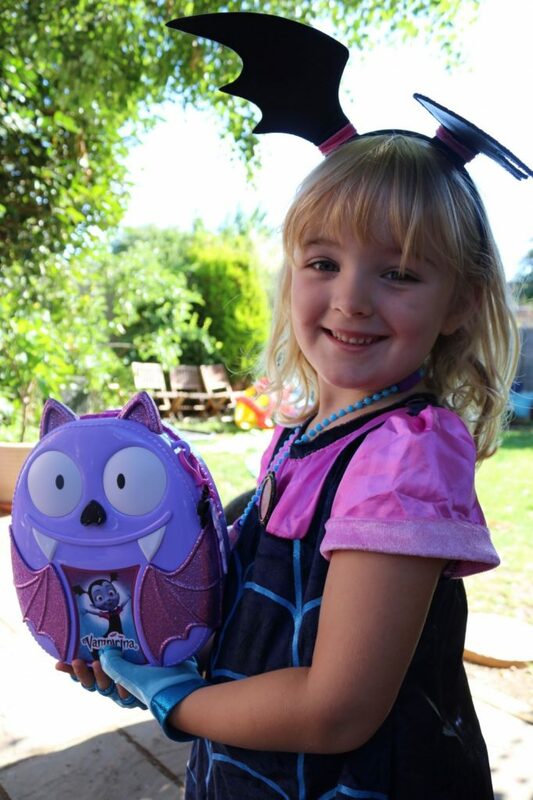 The new Vampirina toy range includes the Bootastic Backpack Set, the Spooky Scooter Set and collectible blind-bagged Vampirina Boo Figures. We were sent the Vampirina backpack and a Poppy Scooter set to review. The bootastic (that’s boo-tastic, took me a while to work out what it had to do with boots. 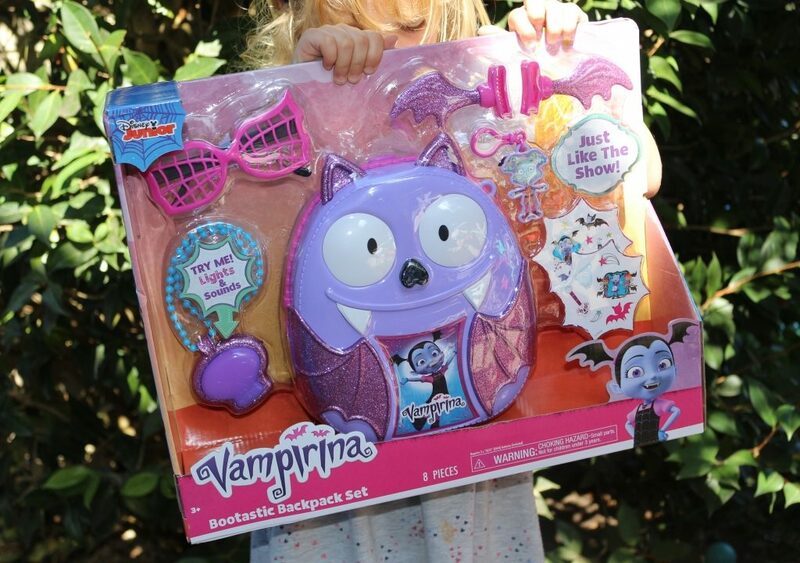 Sigh) set includes a hard plastic backpack which is a direct a copy of the one Vampirina wears in the cartoon, glasses, a lights and sounds necklace, hair clips, a bag hanger and two small sheets of stickers. There is a hook on the bag, so that you can clip on your bag hanger which features Vampirina’s doll and a bat. 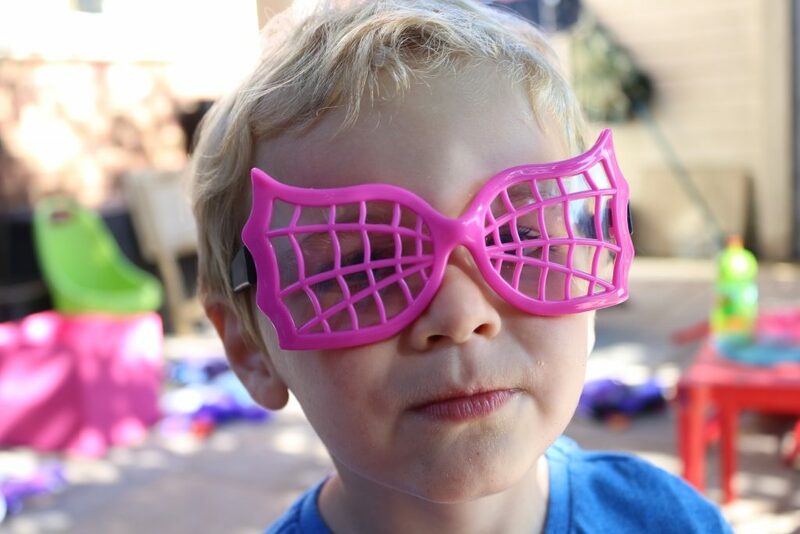 The glasses aren’t particularly practical, but they were a welcome addition to the dressing up box and I’m sure they will be making a reappearance for Halloween as they feature spooky spiders’ webs. 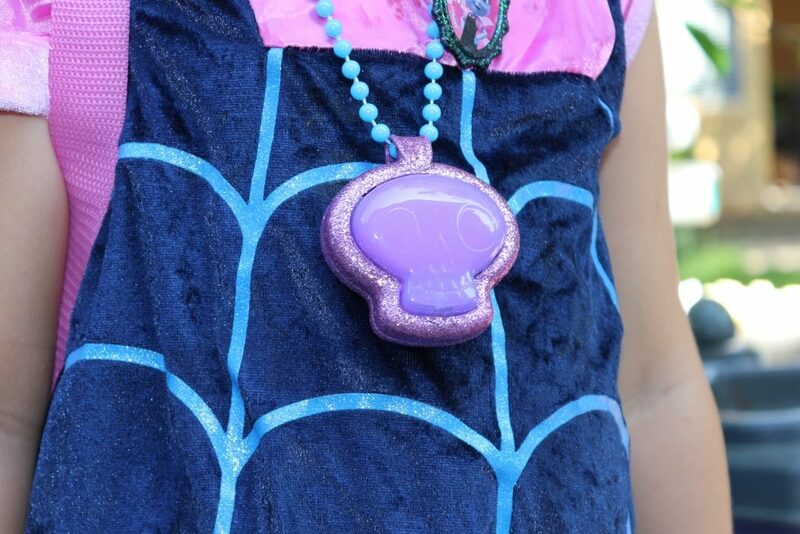 The sparkly skull necklace lights up when you push it, and you can hear phrases from the show. 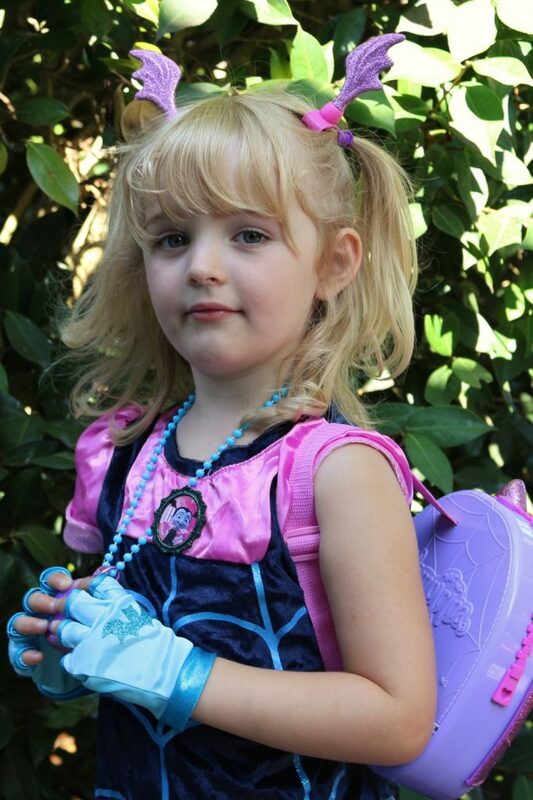 It’s got an easy to pull apart clasp so safe for playtime and dressing up. 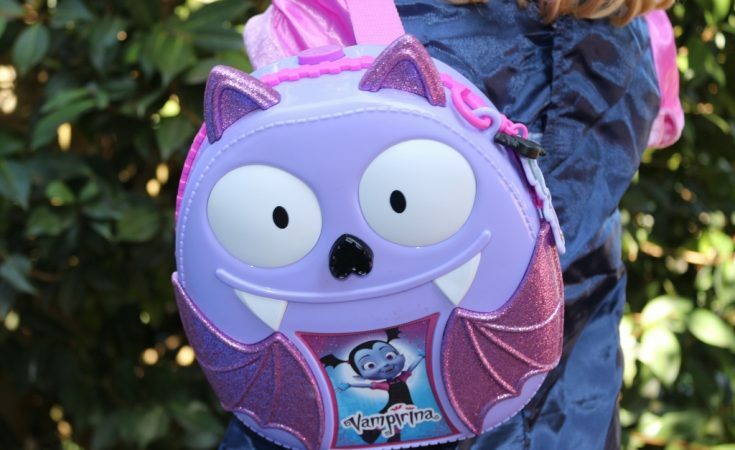 The Vampirina Bootastic Backpack itself has an adjustable nylon strap. It can be worn and used to transport things around, like a backpack should really, although it just has the one strap so can only be worn across one side and it might take a child a while to get the hang of it. It’s the perfect thing to go with the Boo-tiful dress reviewed here. The sparkly hair clips are also a nice addition, as our original batwing ears have gone a bit floppy in the dressing up box. 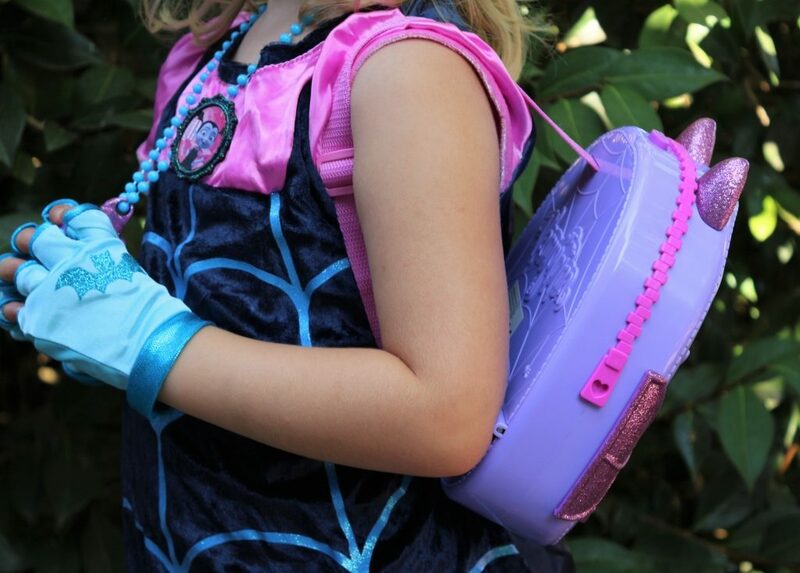 The Vampirina Boo-tastic Backpack is opened by pressing the button on the top and flicking down the back panel. Although it wouldn’t be practical as a school bag, being made of hard plastic, it would also be a cute little bag to take to preschool. 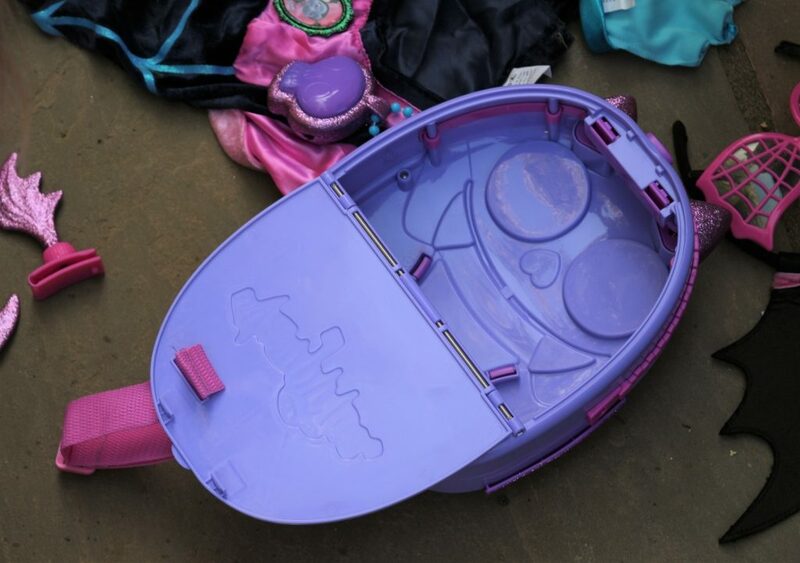 It wouldn’t fit a water bottle inside it, but it has more than enough room for some snacks and change of clothes; on the other hand it makes a great home for all the Vampirina toys and accessories. My little Vampirina wannabe has already taken it out and about with her and is very pleased with it! The Bootastic Backpack set has an RRP of £24.99 and can be bought from good toy shops. 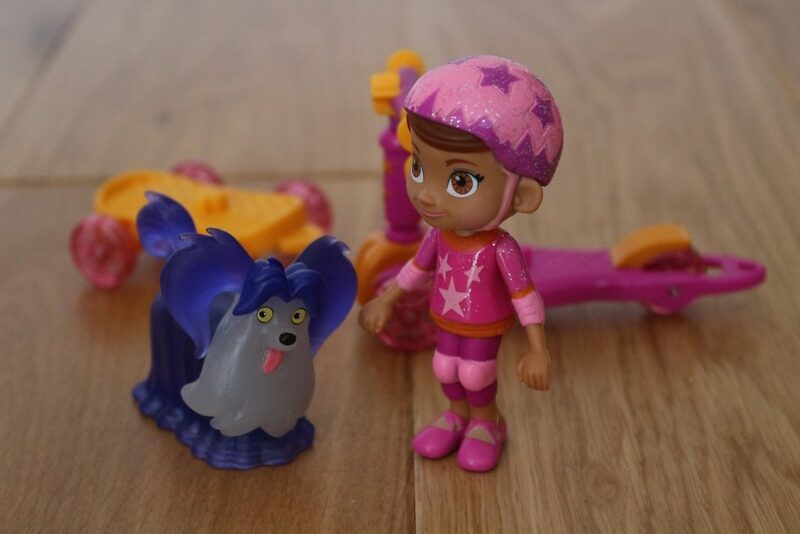 There are two Spooky Scooter sets to collect; Vampirina and Gergoria and Poppy with Wolfie, which is the set we were set to review. Each set comes with a poseable doll, scooter, pet and skateboard. 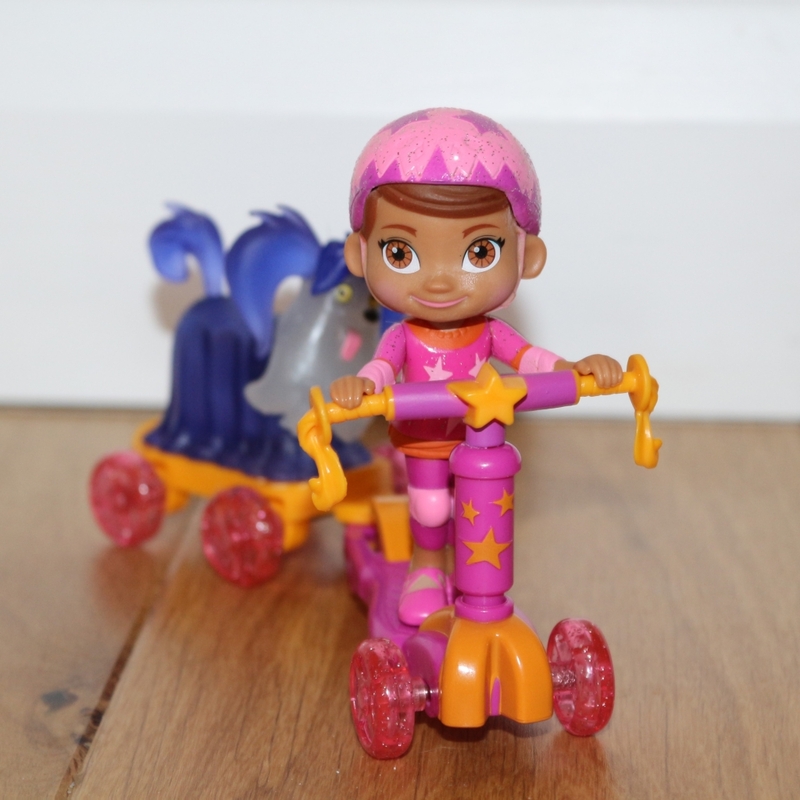 Poppy can ride along on her pink scooter holding the handlebars. The skateboard attaches to the scooter so that Poppy can pull Wolfie along behind her or you can race the two which was my children’s chosen game! Safety obviously comes first as Poppy wears her sparkly pink helmet and kneepads which are fixed on. You can move her head from side to side, her waist twists and arms move up and down so she can grip the handle but her legs don’t move. She has a hole in the base of her feet which slots onto the scooter. If you have the Vampirina Spooky Scooter set you can mix and match the scooters and skateboards. The sets retail for £11.99 each and can be bought from good toy shops or Amazon here (Vampirina) and here (Poppy). 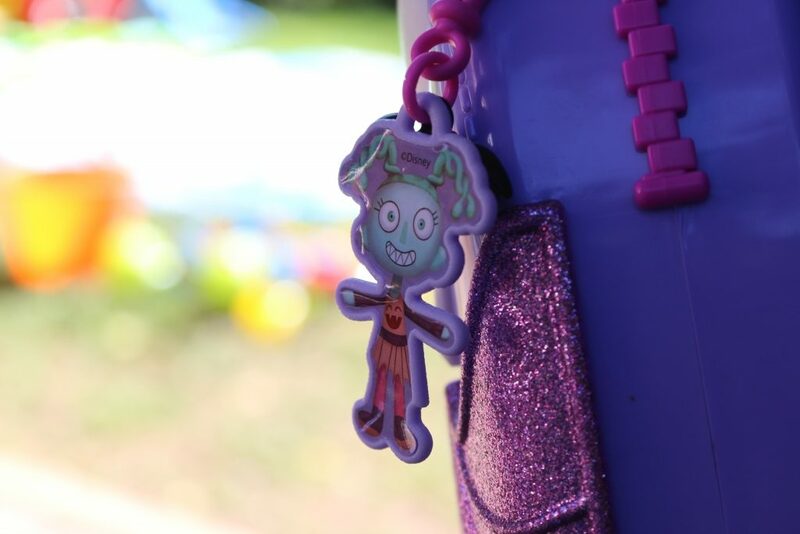 We received these Vampirina Toys free of charge for the purposes of this review but words and pictures are mine.